A year after Israel's bloody assault on Gaza, another war is all but guaranteed. One year ago today, Israel began its 51-day aerial and ground offensive against the besieged population of the Gaza Strip. During the military campaign, Israel concentrated the population into the center of the territory, thus exacerbating its severe density; sealed the borders; launched more than 6,000 airstrikes; and fired almost 50,000 artillery and tank shells. Under these circumstances, the results could only be devastating—and they were. The offensive killed 2,251 Palestinians, including 551 children; communities were devastated, with 142 families losing three or more members; more than 1,500 children were orphaned; more than 150,000 homes as well as 140 schools were partially or completely destroyed; and 373,000 traumatized children were left in need of psycho-social treatment. 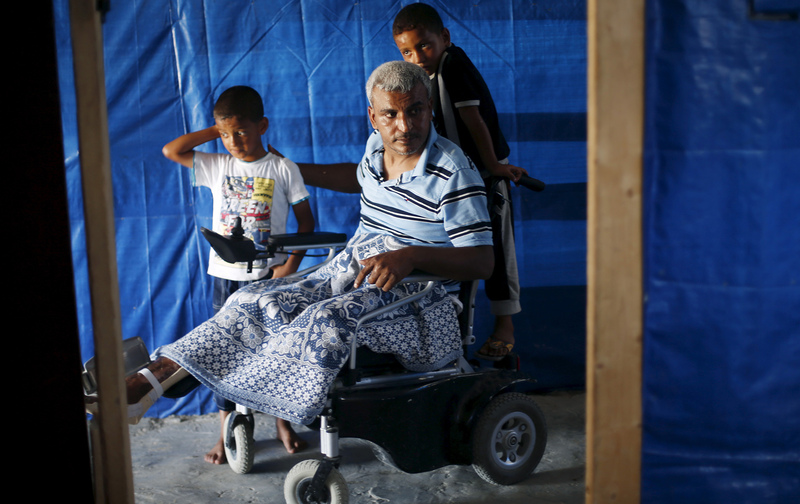 The intervening year has brought little relief to the people of Gaza. Not a single home that was destroyed has been rebuilt, the siege remains intact, and 80 percent of the population is dependent on some form of aid for survival. Yet, amid the instability, Palestinians in Gaza can count on one certainty: Last summer’s onslaught of the Gaza Strip will be repeated with similar or greater force. Despite the ferocity of Operation Protective Edge (Israel’s name for the onslaught), the destruction of the coastal enclave, home to nearly 2 million Palestinians, was not an exceptional policy in the face of exceptional circumstances. It is Israel’s official policy toward the Gaza Strip, and a particularly brutal extension of its broader policy toward all Palestinians. Israel’s policies toward Palestinians are built on a set of twin axioms: to obtain maximum amount of Palestinian land with the minimum number of Palestinian people and to concentrate a maximum number of Palestinians onto a minimum amount of land. Israel removes, dispossesses, and concentrates Palestinians throughout Israel and the occupied territories regardless of their geographic residence or legal jurisdiction. It does so by martial law in the West Bank, by a mix of martial and administrative law in East Jerusalem, and by civil law in Israel. In the Gaza Strip, it does this by siege and warfare. Israel explains its crippling siege and devastating attacks on Gaza as necessary responses to Hamas rocket fire. In this scenario, Hamas is the powerful aggressor, and there would be no conflict without it. Yet this claim does not withstand empirical and historical evidence. Gaza, once a city-district of historic Palestine and now a “Strip,” sits on the eastern coast of the Mediterranean Sea. Its harbor and fertile land has made it a focal point of trade and empire for centuries, including for the Romans, Napoleon’s France, the Mongols, and now Israel. Prior to 1948, the Gaza district contained almost 90 towns and villages. It was 38 times larger than the current Strip, making it the largest district in Mandatory Palestine (the name for the territory during the period of British rule, after World War I), until Zionist militias destroyed a majority of these towns. Upon Israel’s establishment, a truncated Gaza absorbed nearly 25 percent of Palestinian refugees exiled from their former homes, increasing the enclave’s population from 80,000 to 280,000. That number has grown to 1.8 million today, making Gaza one of the most densely populated places in the world. Israel first tried to occupy the Gaza Strip in 1956, during the Sinai War, but was forced to withdraw its troops under intense US pressure after only four months. Just a decade later, during the War of 1967, it occupied Gaza more successfully and immediately began to integrate Gaza’s water system and electricity grid into Israel’s own. Hamas was nowhere in existence when Israel staged both of these invasions. In fact, when Sheikh Ahmed Yassin established the precursor to Hamas as an offshoot of the Muslim Brotherhood in 1973, Israel tolerated it because it viewed the organization as an effective counterweight to the far more popular Fatah and the Palestine Liberation Organization (PLO). Hamas was not established as an Islamic-nationalist resistance movement until 1988, and it did not launch its first armed attack until early 1989, when it captured and killed two Israeli soldiers. In 1991, Israel entered into the Madrid Peace Conference, the negotiations with the PLO that preceded the Oslo Accords. In preparation for incremental withdrawal stipulated by the Oslo agreement, Israel accelerated its isolation, containment, and systematic de-development of the Gaza Strip. It did so in order to separate Gaza from the broader Palestinian-Israeli conflict and to ensure control over the territory under any ensuing permanent arrangement. Israel began importing foreign labor to replace its Palestinian labor force, which had performed much of Israel’s most grinding and lowest paid work. This was the beginning of a particularly challenging period for the people of Gaza. At the end of the Gulf War, in February 1991, Kuwait evicted Palestinians in retaliation for Yasir Arafat’s support of Iraq’s occupation. This caused a complete halt in remittances, estimated at $120 million in 1989, to Palestinians in the Occupied Territories. Together with the fact that Gaza no longer had an export market for its produce in the Gulf, the economic downturn was severe. The number of Palestinian families receiving food aid rose from roughly 10,000 in June 1990 to 120,000 by June 1991, and Gaza’s gross national product fell by 41 percent. Significantly, by 1993, the number of people who depended on aid from the United Nations Relief and Works Agency for Palestine Refugees, the primary humanitarian organization for Palestinian refugees around the world, had stabilized at 80,000. By the end of Operation Protective Edge, that number skyrocketed to 830,000. The years leading up to 1991 also marked the period of the first intifada, the popular, and largely nonviolent, Palestinian uprising (the intifada began in late 1987). Palestinians engaged in civil disobedience, general strikes, economic boycotts and resistance economies, as well as the throwing of stones and Molotov cocktails. But Hamas had still yet to launch a single suicide attack on Israeli civilians when, in March 1993, Israel initiated its closure policy of both the West Bank and Gaza (encircling Gaza behind an actual fence), which controlled the movement of people and goods within and between the noncontiguous territories. In instances of “total closure,” it prevented all entry and exit by Palestinians from the territories. With the borders now fully controlled by Israel, the Gazan economy became completely dependent on Israel and incapable of self-sustenance. Nine months later, Israel and the PLO signed the Oslo Accords. Shortly after that, then–Foreign Minister Shimon Peres told a UNESCO conference that he saw the Gaza Strip progressively evolving into a Palestinian state, while the West Bank would become an autonomous polity of Palestinians and Israeli settlers whose status and borders would eventually be defined. The WHO predicts that, due to siege and warfare, the Gaza Strip will be unlivable by 2020. By the eve of 1994, Israel had sealed Gaza, set it on a course of de-development, and set it apart from the broader conflict with the intent of establishing it as the Palestinian micro-state—all before Hamas launched a single suicide attack or mortar into Israel. Hamas launched its first suicide attack on April 6, 1994, in retaliation for the murder of 29 Palestinians praying in the Ibrahimi mosque in Hebron. In 2000, during the start of the Second Intifada, Israel declared that it was now engaged in an “armed conflict short of war” in the occupied West Bank and the Gaza Strip and deployed unprecedented military force against Palestinians, including aerial bombardments and airborne extrajudicial assassinations, also known as targeted killings. In this context, Hamas launched its first rocket into Israel in March 2001. In April 2004, then–Prime Minister Ariel Sharon publicly announced his plan for unilateral disengagement from Gaza in exchange for consolidation and control of settlements in the West Bank, thus setting in accelerated motion Peres’s vision for Palestinian statehood articulated in his UNESCO speech. Sharon’s senior adviser, Dov Weisglass, explained that the disengagement was meant to freeze the peace process by supplying “the amount of formaldehyde that is necessary so there will not be a political process with the Palestinians.” The idea was that unilateral withdrawal would alter the balance of power by offering a veneer of Palestinian independence without relinquishing Israeli control. To prepare for disengagement, Israel embarked on a series of military campaigns that continue to the present day. Israel launched the first campaigns in April 2004, a little more than a year before the disengagement in August and September 2005, with the aim of expanding the northern and southern buffer zones between the Gaza Strip and Israel. Since disengagement, Israel has declared several all out wars against the Gaza Strip. It tightened its siege in January 2006, when Hamas won parliamentary elections in Gaza, and declared Gaza a “hostile entity” in September 2007, after Hamas routed Fatah from the Gaza Strip in response to a US-backed preemptive coup. Upon Hamas’s assumption of power in Gaza, Israel, together with the United States and the European Union, imposed the most severe form of a naval blockade and land siege experienced by Palestinians in Gaza. The siege together with Israeli military campaigns ushered a humanitarian crisis in the Gaza Strip, and it is in this context that Palestinians began building a tunnel network to survive, and resist, the blockade. Hostilities between Hamas and Israel continued during this time until Egypt negotiated a cease-fire in June 2008. After just four months, Israel broke that cease-fire, thus triggering Operation Cast Lead, which lasted for 22 days, from December 27, 2008, until January 18, 2009. Israeli forces killed some 1,400 Palestinians, including more than 300 children, and injured approximately 4,300 others, including 1,100 children. They also destroyed 2,900 homes, 29 schools, 121 commercial and industrial workshops, 60 police stations, and 30 mosques. Significantly, the Israeli defense minister at the time, Ehud Barak, had begun planning Cast Lead long before he helped launch it, some six months before, as Israel was beginning to negotiate the June 2008 ceasefire. Israel and Hamas then entered into another cease-fire that Israel disrupted when it assassinated Ahmed al-Jabari in November 2012; Jabari was the designated diplomat representing Hamas in negotiations with Israel. This assassination triggered Israel’s second large-scale military offensive since 2008, Operation Pillar of Cloud, which killed 177 Palestinians and injured approximately 1,500 others in eight days. The operation launched one year ago, on July 7, 2014, which Israel provoked, is a continuation of these policies and worse than any of its predecessors. Under the present circumstances, the premature death of Palestinians in the Gaza Strip is inevitable. Insisting that Hamas rocket fire explains Israel’s engagement with Palestinians in Gaza does not adequately explain Israel’s decades-long policies toward the coastal enclave. It also does not explain Israel’s policies toward Palestinians in the West Bank, including East Jerusalem, or within Israel who continue to endure removal, dispossession, and containment despite the lack of rockets from there. Israel’s policies toward Gaza are an extension of its ambitions to remove and replace Palestinians living on their historic lands. The cessation of this violence requires a comprehensive political solution that grapples with the settler-colonial conditions endured by all Palestinians. At this point Israelis and Palestinians are in a holding pattern. The question is for how long? The World Health Organization predicts that, due to siege and warfare, the Gaza Strip will be unlivable by 2020. Given Israel’s destruction of Gaza’s tunnel networks in the summer of 2014, its only lifeline since 2007, relief from this intensifying humanitarian catastrophe is nearly impossible without ending the siege. Therefore, as far as some Palestinians are concerned, they will either die quietly at the hands of these cruel policies or die in front of cameras militarily resisting these conditions. Under the present circumstances, the premature death of Palestinians in the Gaza Strip is inevitable. Responsibility for altering this course belongs to all of us—individuals, organizations, and states. The status quo in the Gaza Strip today is a function of human-made politics, not natural disasters. And it will take human-made solutions, captured in a series of political choices and formative junctures, to upend the status quo and alter this daunting calculus. Noura ErakatTwitterNoura Erakat (@4noura on Twitter), a human rights attorney and activist, is an assistant professor at George Mason University, and a contributing editor of Jadaliyya.